Q. 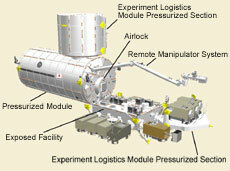 Could you explain the role and significance of the Japanese Experiment Module Kibo? First of all, Kibo is Japan's first human space facility, and it represents the fruits of our country's advanced technologies. Kibo is going to be the base for Japanese space activity, and it will eventually benefit all humankind. At the moment, only the United States and Russia have such permanent space facilities, but Europe and Japan are going to have their own in 2007 and 2008, respectively. It was unfeasible for one nation to build the International Space Station on its own, so 15 nations decided to collaborate. Within the framework of this international project, Japan should first use Kibo to accomplish its own goals. There are also American and European experiment modules on ISS, but Kibo is a laboratory where Japan can freely conduct experiments just for itself. Kibo is also the only ISS experiment module equipped with both a pressurized module and an exposed facility that allows us to perform experiments and observations in the vacuum of space. 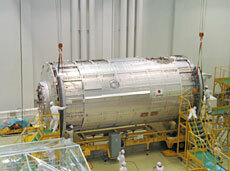 The completion of Kibo promises a new era for Japanese space development. Space experiments on the space shuttles last only a week, or two weeks at most, but Kibo will allow us to perform longer-term studies. We will finally be able to conduct experiments in such fields as new material development, which require a lot of preparation time, and to study the impact of long stays in space on the human body. We anticipate great outcomes. But Kibo is not only about experiments. Its construction and operation allow us to maintain, combine and further develop Japan's advanced technologies. Developing the capacity of long stays in space will accelerate Japan's progress in science and technology. The experiments we do in space will allow us to gain new knowledge and apply it to such fields as industry and medicine. And at the same time, it is also very important to acquire new technologies through research and development, and to build international relationships through cooperation. Cultural activities are another major objective. There is something about space that touches even people who are not interested in science. As part of its cultural initiatives, JAXA has invited public applications for the Space Poem Chain. This is a project for pondering the universe, the Earth and life, together with others, across borders, cultures, generations and specialties. Its first phase, from October 2006 to March 2007, gathered submissions from about 800 people aged 8 to 98, from Japan and overseas. 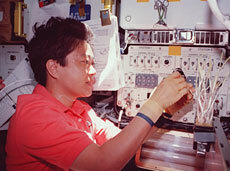 Once the poem chain is complete, it will be recorded on a DVD, and will be taken to Kibo (which means "hope" in Japanese) by Astronaut Takao Doi in 2008, to be archived. The second phase, with the theme "There Are Stars", started in July 2007, and the poem chain is currently being compiled. It's also very meaningful for the Kibo mission that so many people think about human space activity from their own point of view, and depict this in the form of a poem chain. Q. 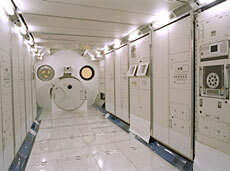 What kind of experiments will be conducted on Kibo? And how will the outcomes benefit our lives? The initial experiments will be about fluids and cells. These experiments aim to discover the nature of phenomena that cannot be observed under Earth's gravity. In the fluid experiments, we'll be observing the properties of convection under microgravity, in order to understand flow dynamics that are too difficult to observe on Earth. Even though we know this particular type of flow has an impact on the production process of semiconductor materials (i.e. crystals), its dynamics are still poorly understood. I believe this work will be key to developing new, better-quality materials. And I'm also anticipating that the results of this work - observing the complicated process of crystal growth from liquid - will help us reduce impurities and broken crystals in the process of material production. Once we have a better understanding of crystal growth, this knowledge can be applied in industry, for example in the development of new materials. And furthermore, since proteins are so essential to our bodies, we can apply discoveries about protein crystals to the development of new medicines. In the cellular experiments, various cells will be grown in space, analyzed at the molecular and cellular level, and compared to cells grown on Earth, in order to understand the impact of an environment of microgravity and cosmic radiation on living bodies. For example, we know that plants somehow perceive gravity - their roots grow downwards and stalks grow upwards. But how this works - which plant cells act as gravity sensors - is so far unknown. There are some hypotheses based on experiments carried out on the ground, but we are hopeful that space experiments will help us find a definitive answer. Understanding the mechanism of plant growth can benefit agricultural production. Also, we will be studying the cellular basis for variation in bone formation and conservation of muscle mass, in order to understand why long stays in space cause bone loss and muscle atrophy. This research will help decrease the impact of long stays in space on human beings. On the ground, it will help prevent muscle atrophy caused by immobility, and osteoporosis. Experiments with aquatic habitats are planned for 2010 or later. Japan has the best techniques to grow aquatic habitats in confined spaces, such as a space module. On Kibo, the impact of gravity on living organisms will be examined using the ancient Japanese Medaka fish (Japanese killifish). Gene decoding of the Medaka fish is quite advanced in Japan - we've decoded 90 per cent of its DNA. And we've learned that 80 per cent of its genes are identical to ours. So studying this fish's DNA further is expected to bring significant results in the field of medicine. For example, if we can isolate the gene that causes a particular disorder in the fish, we may be able to understand how a similar disorder is induced in humans. The advantage of working with Medaka fish is their rapid growth rate: three generations are born in just 90 days. We plan to grow Medaka on Kibo for more than 90 days, in order to observe how fish that have never experienced Earth's gravity grow and behave in space, and how their gene activity will vary. These will be very interesting experiments. On the exposed facility, the initial experiments will be X-ray astronomical observations. An all-sky survey of cosmic X-ray sources in outer space will be conducted, and the world will be notified of flare events, such as supernovas, when they are observed. We will also study the minor chemical components that deplete the Earth's stratospheric ozone layer. This will give us a better understanding of the level of destruction of the ozone layer. In addition to these already scheduled experiments, we are discussing other proposals for projects in collaboration with foreign scientists. There is definitely rising interest in scientific work in the vacuum of outer space.